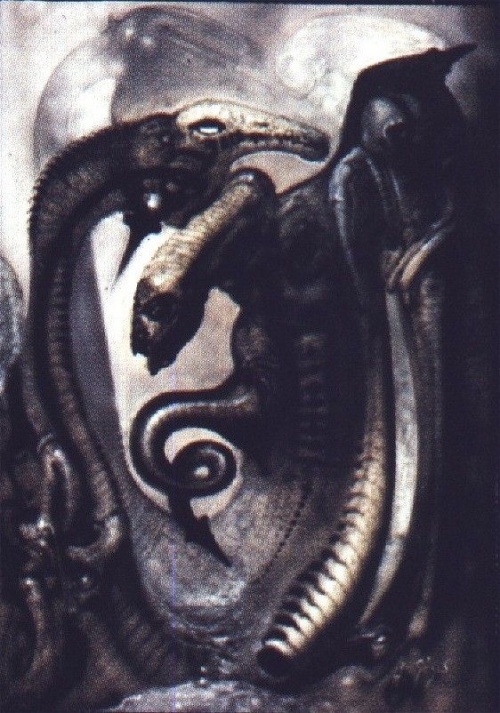 Alien Explorations: Giger's Mordor III (Work 279): spectre of H P Lovecraft or Beardsley? spectre of H P Lovecraft or Beardsley? 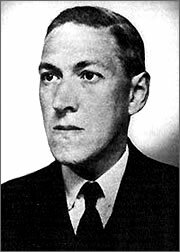 a) H P Lovecraft ? A landscape becomes a half suggestion of H P Lovecraft's face, with the worming thing on the right framing the jaw an cheekbone with the light upon the elongated head of a strange creature becoming the nose while its curling tales becomes the position of the mouth. A point of light that's a negative space above the long headed beasts head becomes the white of the left eye. There is almost not much at all to understand that there might have been the semi intention of having something shaped like his face since his face would have generally in his mind. (22nd November 2015) Another direction to go with this if one has to face the utter doubt about who it, is that it might be Aubrey Beardsley's face, an illustrator who was an author and an illustrator, and with the latter part of the Art Nouveau scene which is a style of art that Giger incorporated into his own style and his face and ears had a general similarity to Lovecraft's general features. 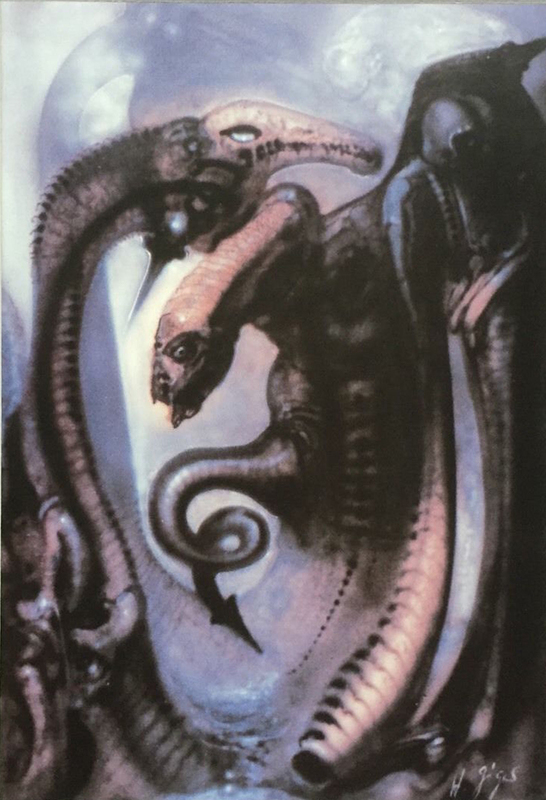 If there are any more clues in the painting, what we have to look at is so low in resolution that it is difficult to see and perhaps Giger really never aimed to make it clear.